In the early morning of Thursday, January 7, 2010, two days short of his 74th birthday, the life of Pedro Rusconi, better known in the world of tango dancing as Tete, completed its full cycle. Close friends will remember as long as they live his inimitable mischief and innocence enlivening the popular milongas in Buenos Aires. Tete’s absence is a painful reminder for many who have known about his indefatigable presence among the exclusive circle of friends since the resurgence of the tango as a social dance in the late eighties. He was the darling of many youngsters. For an even larger world population Tete was painted as an iconic myth who allegedly invented the close embrace milonguero style, a claim he never made nor typify in the colorful style of his dancing. The reality was, as some tango bloggers pointed out, that although he was admired tremendously, not everyone cared much for his style of dancing. From thinking that he was overrated and difficult to dance with, to adoring him, he was one of the many personalities of the milongas in Buenos Aires. Everyone loved him. That’s life in the world of the milongas in Buenos Aires. In sharp contrast to many Argentines who finagle their way into the American market with the most ridiculous resumes claiming to have taught at “close embrace milonguero style” academies in Bs. As., to impress unsuspecting organizers, Tete did very little traveling compared to those who have appropriated the “close embrace” mantra while spreading poor instruction, teaching very little, because they are guaranteed repeated business. He first had a rare appearance at a Tucson, AZ tango festival in the late 90’s, and a couple of tours in the past five years through the circuit supported by the “close embrace” cartel that cycles practitioner after practitioner of that style several times a year in preordained cities. For anybody with an independent mind, it has always been obvious that the way Tete danced had in no way any resemblance to the choreographed multiple iterations of the so called “ocho cortado” schools. Promoters paid lavish lip service to a person who looked and acted different to what the press releases claimed. Yet, what has had massive circulation in lieu of a real biography of Pedro Rusconi, are several manifestos made public in which Tete lectures and admonishes those who take the dance of tango in vain. Vested with a natural angel for moving with the music with a consensual partner hanging from his neck, Tete was one of those living examples of individuality and confidence that eludes those who think imitation is the way to be recognized for something else than being imitators. When it came to heed his advice/lectures/admonishments calling for respect to tradition, to the music, and to the dancers sharing the floor, Tete became a topic of conversation, name dropping and video watching but not an example to follow. Chicagoan Sarah Graf interviewed Tete and his long time partner Silvia Ceriani at the University of Chicago on April 20-22, 2007. From that, we learn that Tete started dancing at 14, which means that he was still wearing short pants and what he danced was what every other teenager danced in the early 1950’s, rock and roll. Later, he worked for the city of Buenos Aires as a public employee from 7pm -1am. After work he went out dancing and got to bed by 8am, sometimes missing work. Tete was a rock and roll champion for 5 years. Once he entered a marathon dance contest with people from all over and all kinds of dances. He beat the record of 102 hours of dancing with his 137 hour-long marathon. In case it is not obvious, during those early years of his life, Tete was not dancing tango. Almost nobody did until well into the 1970’s. 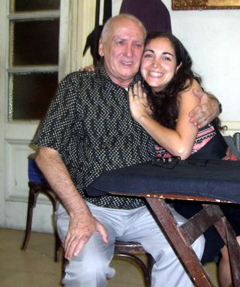 Tete and Silvia began dancing together in 1995, a period when the resurgence of tango because of tourist influence brought back the popularity of the dance. They traveled together to Europe in 1996. 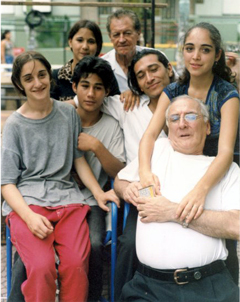 In 1997 German choreographer Pina Bausch invited Tete to Europe. He danced a piece of hers called “Nur Du” (only you) for three years in a row. She also invited him for the 25th anniversary of Tanztheater Wuppertal. There he danced “Nur Du” with her using his tango embrace. It was a 30-day spectacular and some of the best dancers in the world, including Nureyev, were there. Very little else is learned about the man after that, as the interview turns into platitudes about how the present played in the past, a natural approach when solid understanding of the social, cultural and historical evolution of a foreign society is lacking. Very patiently Tete answers a series of questions associated with tales and myths about “the old times,” without any further details about his life. As one reflects on the passing of Pedro “Tete” Rusconi, there is a compelling desire to remember those who had a marked influence during the formative years of the tango in North America before passing away: Rodolfo Cieri, Jose Vasquez, Lampazo, Juan Bruno, El pibe de Ciudadela, Pupy Castello, Carlos Gavito and Nestor Ray. Theirs was a time when blogging didn’t exist, writing on Internet lists was inhibited by a lack of fluency in the English language. All we have been left with is the echos of their words, in our minds, on tape, film or print, but it is not the same as having the sound of their voices expressing their opinions and beliefs. Tete went to sleep at his boarding house when the new sun was painting anew the muddy waters of the Rio de la Plata with the colors of a lion. A few days early, on a Sunday, he had shared a table with the usual friends, and he was very excited about the following Saturday when he would be celebrating his 74th birthday. He just never woke up going into eternal rest and becoming yet another legend to fascinate people’s imagination for years to come with his unabashed way to speak his mind.